Hair washing - why didn't I think of this? This falls into the category of why didn't I think of it sooner. The idea came from April after the post about Little Colour Bottles. You know she's not only the gal behind goosedesigns she's also a Montessori teacher. Lucky kids. Anyway, I know this wouldn't work for everybody. Caspar doesn't have much hair. He had his first hair cut at three. It's also really fine. Hair washing has always been a drama. Then I questioned, why am I still washing his hair for him? I know as parents we want to look after our children, but why do something for them they can do themselves. Also Caspar is a shower kind of kid now. I don't like getting wet every time he needs help. I didn't like the idea of using the single serve bottles, I really don't want to be filling up shampoo bottles everyday. I don't trust him with a full shampoo bottle either. I simply filled up and labelled baby shampoo bottles left over from Otis. They are small but not too small and I'll only have to fill them up every week or so. If he happens to spill, squirt or otherwise use the entire bottle it's not such a loss. Has it worked? Yes, his hair has never been cleaner and he hasn't once complained of getting shampoo in his eyes. Hooray. Don't you love the smell of freshly washed kid's hair? Yum. We're not currently using it but MOP Pear Shampoo is my absolute favourite for kids. Have smell of it and you'll know what I mean. We don't have a schedule for rotating Caspar's books, toys or materials. He is old enough now that he will change things around on his own or ask for assistance. Christmas, birthday or any other time he receives something new is always a good time to rotate or shift things. Otis's materials are very different. I intentionally rotate these often, sometimes weekly. Our storage cupboard contains mostly Caspar's materials. Otis's things are generally stored in his room. This cupboard is never really tidy so lots of baskets work well for me. Caspar can reach and has access to the bottom two shelves. We like to keep our books in four different sections; fiction, non-fiction, early readers and board books. This is important to us right now. Caspar loves early readers. He can read some of these books by himself from guessing the words or from memory. It's great having easy access to board books for Otis who cannot be trusted with paper pages. I wanted to write a short post about toys. Caspar is no different to most children in the toys that he has. So this post isn't special in any regard. I really wanted to point out that he does have toys and we are not as constrained as it might have appeared from the post on his room. His favourite toys by far are his Bruder trucks and diggers. He has a few of these stored on the floor of his wardrobe as pictured above. We rotate these regularly or as requested with the rest of his collection stored on the very top shelf of his wardrobe. We love Bruder as they are replicas of the real thing, built to scale with working parts. We also have three baskets and a tin that are stored in our living room. We sometime rotate these and other times we have them all out. Playmobil, cars and trucks, puppets and a train set. Caspar received the Playmobil for Christmas and we are still learning how to store and handle toys with so many small parts. Caspar has a very small Lego collection and a few other toys that are stored on his shelves with his other materials or in our storage cupboard (which will be in the very next post). He also has a bag of dress-ups or as he calls it his "costume bag" floating around the house. There were a few discussions about toys at Christmas time. Now that Caspar is four our family and friends have a really good idea of the toys that we like and Caspar likes the best. As long as the toy isn't dangerous or violent we allow Caspar to keep and play with all the toys he is given. We have found open communication and some times very specific suggestions work well. Looking at these toys it's obvious Caspar is a boy. Before having children I wasn't convinced that boys liked trucks over dolls, I thought they were conditioned this way. But now I know it is so true, at least in this case. He does like pink though. That was tough. Real tough. Thank you so much for your comments, thoughts and words of wisdom. I would love to reply to each one of you but at the moment I'm not able. I have read every comment and will follow up with every book suggestion. Thank you for those comments that made me think deeply and realise how differently children grieve. This information became so important to me over the last couple of days. We are now as a family celebrating the life of our beloved dog and finding ways to keep his memory alive. To lighten things up a little I have attached some photos of Otis playing with his food. He eats mostly family food now but at dinner I still give him some mushed food. Remember it's hot here and no shirt at the table isn't the norm but it is totally acceptable. The next few posts are from last week that I didn't get around to posting. I also have a couple of posts to write to cover some of the questions asked previously about Caspar. I hope to get to this soon. Once again thank you for your continued support and comforting words. The hardest day in my parenting life. I was up all night and morning comforting our dog. He didn't make it. We was old and had been with us for a very long time. He's family, like our first child. Caspar slept through it all. I didn't know how to tell him. How to talk about life, love and death with a four year old? I sat next to him with Otis playing in a different room. I was calm and clear. I used real words and told the truth. Caspar seems rather clinical about it. Perhaps he'll feel differently in a couple of days. Today he was mostly concerned about me. He wanted to make me happy. I wept all day. I tried to control my grief but at the same time needed to share with Caspar the process of losing a loved one. My eyes are sore. I'm so tired. I loved that dog so much. Happy Australia Day! Late in the afternoon while everyone else was resting Caspar and I entered the kitchen to make a Bird Seed Garland. He had a blast making this. We used this recipe I found by following a couple of links. It's a good recipe because it uses basic ingredients. We only used half the recipe because we didn't need to make so much. It looked so good Caspar wanted to eat it! We pressed the mixture into small muffin tins and to speed up the drying process placed them in a warm oven. We strung them onto embroidery thread and positioned in the tree. This is our favourite bird watching tree. It's currently full of fruit so the birds are not going hungry. I'll remember this recipe for winter. It'll look great when the tree is bare. Please let me know if you have an alternative recipe to share. We'd love to experiment next time. Oh - I recently came across this blog and thought you might like it too. Amy from Natural Aussie Families recently wrote an article Back to School BPA Free. Getting ready for the new school year was already on my mind. Caspar's old lunchbox was good in every way except for the BPA. I knew it had to be replaced. Many months ago I met with a friend who had a really great lunch box. She gave me the details of Little Green Table and the rest is history. Caspar's new lunch box is completely and confidently BPA free and still meets my other requirements. It's a must that he can use it independently and that it can go in the dishwasher. We chose the ECO Lunchbox and while I was there picked up some Kids Konserve storage containers, great for travelling and snacks for Otis. We already use 4 My Earth pockets. I also recently picked up a BPA free water bottle for Otis from At Home with Montessori. Caspar doesn't usually use a lunch box at home but he really wanted to try this one out. I love how authentic the stainless steel feels. I'd actually like one of these for myself. I'm not sure what to do with his old lunch box. Perhaps storage for art or craft supplies. Looking at the lunch boxes of some of Caspar's friends a lot of them contain BPA or the BPA content is unknown. I would love to hear if anyone else has gone BPA free or if this is on your mind. Caspar is four and the Montessori material he uses the most at home are the Sandpaper Letters. Sandpaper Letters are so practical as an at home material because there are so many ways in which you can use them. Sandpaper Letters are my number one material for preschoolers, they are absolutely worth the effort if you make them yourself or worth the cost if you purchase them. 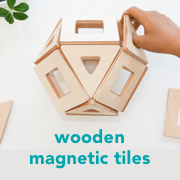 For Australian (and New Zealand) readers I purchased this set from Wood Puzzles but I think the Montessori Shop has a fantastic range. I have written previously about how we use Sandpaper Numbers with the Sand Tray and Sandpaper Letters as part of our Letter Treasure Hunt. In the picture above Caspar recently used the letters as a reference to cut out the letters of his name and glue them onto a sheet. This activity allows him to explore the different ways letters are written. I made it easy for him and gave him words already cut out of a magazine. Most of his work so far has been with the letters of his name. He has also shown an interest in k which sounds like c and o for Otis. It's also really easy to turn a c into an o. It surprised me that today he wanted to work with y, for his favourite food - yoghurt. We don't take a formal approach to using any materials at home. I think all parents of preschoolers in some way work with their children on letters and their sounds. 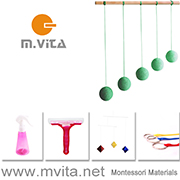 It's just that we take a Montessori approach. Which is why I love the book Montessori Read and Write by Lynne Lawrence. It's written for parents. Not for teachers, not for homeschoolers (although I'm sure they would find it useful) but for everyday parents like us. If you have Sandpaper Letters (or thinking about it) and don't know where to start this book explains it all clearly. It takes you step by step on how to prepare your child and exactly when to introduce them. It's also a really good guide for playing sound games, which we do a lot. The book includes templates if you wish to make the letters yourself. Caspar is four and I find the activities in this book for three year olds most relevant to him. An indication that age isn't the best determinant of activities for your child. If Caspar isn't interested it's a good sign the activity isn't the right one for him. Caspar doesn't have good recall. A letter he knew one day he forgets the next. Unlike many of his younger friends he doesn't know the sounds of all the letters. What is most important to me right now is that he is interested in the letters and that we are fostering a life long love of learning. He's an avid reader though. I'm proud of that. I've been feeling disheartened this week. I took a step back to revisit the basics. I really wanted to share. Allow the child to have responsibility within their capabilities. Caspar has been asking about the plants, the flowers and their names. I was slightly embarrassed about my lack of horticultural knowledge. I looked them up. I thought it was important to know. So we would remember I took some photographs and made Scavenger Hunt Cards. All the leaves and flowers are right here in our garden. Scientific names too, great for language development. This post will give you some insight into our day. Hopefully it will answer questions about how and what we do. It's school holidays and we have planned to spend the day at home. Keep in mind this is just a snapshot. When I wake my husband has left for work and Caspar is up and dressed. Otis is awake and we all have breakfast. I shower and get ready for the day. Otis stays near me playing with a basket of toys on the floor. Caspar sits on my bed and reads. Much like in this post. Half an hour later he is still there reading. Otis spends some time in his room before being joined by Caspar. I tidy and do some laundry. Caspar then goes into the lounge for some imaginary play. At the moment he is big on imaginary play. He usually plays pirates or police. Otis joins Caspar. Caspar is playing with his cars and then they play blocks together. Otis gets tired. I put him in his room and keep checking on him. Eventually he sleeps. Caspar and I play mystery box. I choose three animals (giraffe, elephant and zebra) and three fruits (orange, apple and banana). The child uses touch to identify the object. This is easy for Caspar and we play mainly for fun. Caspar and I eat lunch. Otis wakes and has his lunch (banana, strawberry, pasta and chicken). Otis plays in his room while I clean and tidy lunch dishes. Caspar joins Otis and they play. The boys share pasta and crackers on a blanket on the grass outside. I notice Otis sitting with his legs in a new position. Caspar is working on a photography project and takes some photographs outside. It's a lovely warm day so we put some water in our clam shell. Caspar makes footprints and plays in the water. He could do this all day. Caspar says he wants to do some colour mixing. Last time he tried colour mixing he had difficulty using the dropper. To help him with the dropper I give him this activity first. Otis sits next to him having some yoghurt. Caspar then continues with colour mixing. Otis gets tired and I put him in his room for his afternoon nap. He keeps on getting out of bed. I read to him in my arms until he settles then put him back down to sleep. While Otis takes a (very short) nap Caspar does some creating. I tidy, get a snack for myself and have a cool drink. I help Caspar write a letter to his friend Gabby and he continues drawing. Otis wakes and we go on a nature walk. Caspar continues with his photography project and Otis naps. When we return there is some craziness while we wait for my husband to get home. Once he is home he plays with the kids then it's dinner, bath, play and bed. Besides the decision to spend the day at home our activities are not planned. The only time we plan is if we are going to do something that needs materials like our recent scarecrow making or tomorrow's Scavenger Hunt. Wow, that is my longest post ever. Thanks for reading (or skimming) to the end. I hope it answers more questions than it creates. If you do have any questions though let me know. I love looking at children's bedrooms. Here is a peak inside Caspar's. It's full of things he likes to play and tinker with. I think you could call it eclectic. The fresh flowers are my favourite touch. Always fresh flowers. Did you read Sara's last post over at Feeding the Soil? We have begun working on a project together. I'm so excited about it. Actually I have a couple of new projects underway that I think will be totally amazing but will require a bit of hard work and time away from the blog. So for the rest of this week I will be working solely on these new projects and I'll be back here again next week. A recent comment got me thinking. I have been a little absorbed in the world of babies and have been posting a lot about Otis. To even things up I have decided next week I will post exclusively about Caspar. If you have any questions or areas you would like me to cover please leave a comment or email me. If I don't recieve any questions I will write about topics of my choosing, all relating to Montessori and my favourite four-year-old. So if you have a three or four year old child and are interested in Montessori next week will (hopefully) contain some useful information for you. I'm sure you've noticed the banner and font changes. I absolutely love the new look. It's clean and modern. What about you? Do you like it? Be honest and let me know. Sitting, non-mobile babies are the best aren't they? I'm not ready to let him loose in the kitchen yet but he had a blast (and was oh so cute) making noise with these metal measuring cups and spoons. The gorgeous quilt he is sitting on was a gift from my cousin (Thanks Rach!). There are so many crafty/sewing projects that I would love to do. Quilting I believe takes time, skill, patience and accuracy. All of which I lack right now. I haven't given up though. Just acknowledging now isn't the right time. Anyone have experience quilting from a kit? It must be easier. I'm dreaming of this quilt but I'm not sure I have the courage. My husband and I made the decision a couple of years ago that we would send our children to a Montessori school. It was a big decision. So many questions. Such a commitment. For my husband the main consideration was the financial commitment. Like so many we don't have access to public Montessori schooling and our private school is expensive. While my husband is also supportive of the Montessori principles at home there is the odd diversion. He is less consistent then me, offers the occasional chocolate bribe (to Caspar not Otis!) and is much more relaxed with the television. My point being that if it is Montessori at school or Montessori in the home you need to be on the same page as your partner. How do you make sure you are on the same page? How did I introduce my husband to Montessori? First I gave my husband a copy of How to Raise an Amazing Child by Tim Seldin. It's easy reading and gives a light overview of Montessori. I took my husband to the school open day and followed up with observations of each cycle. Fortunately it was enough to secure his support. I think it was also important for my husband to know that I had done my research. This wasn't a fad. I made sure I knew not only about Montessori but also about how our particular school operates. I researched enough so I was aware of some of the common myths and oppositions to Montessori. But what if this isn't enough to get your partner/husband's support? Have you seen Montessori Madmen? If my husband still needed convincing I would send him straight to Montessori Madmen. I'd ask him to take a look around their blog and check out all their links including the link to this site. If he still wasn't convinced, we would probably need to take a good look at how we communicate and how we'd go forwards in choosing a school. For me anything less than a Montessori school is a compromise, but you know I'm really committed like that. I'd love to hear your experience or any suggestions you may have for others trying to get their partner on board. If you are new to Montessori keep in mind the discussion and decision about Montessori schooling needs to occur early. Some schools only accept children at three years and some have waiting lists - check with your preferred school.